Kenny J: It’s been a while since I’ve read anything by Ryan Browne. After following his Kickstarter for God Hates Astronauts I was ecstatic to read it’s continuation under the watchful gaze of Image. 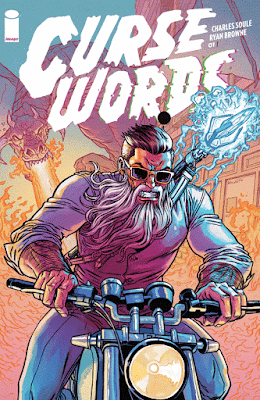 Now Browne is back with Curse Words #1, adding his larger-than-life character designs to Charles Soule's words. I’m looking forward to seeing what ideas these two imaginative creators can dream up between them but the solicitations alone fill me with hope as they show talking koalas, biker wizards and lots of over the top action. It’s a small week for me come this Wednesday as out of the slew of new, reimagined heroes that Marvel has been pumping out over the last few years, Riri is by far my favourite, so I’ll definitely be checking in on Invincible Iron Man #3. It seems the Marvel Universe is full of geniuses these days, with smarts being the new brawn, but Ironheart’s backwards engineering of Tony Stark tech, complete with AI, is a story I find particularly compelling. In all honestly I’ve really enjoyed what Brian Michael Bendis has bought to ol' Shell Head's part of the world and look forward to seeing where he takes it next. James R: Back in my increasingly distant youth, before we had a local comics shop, I had to rely on the newsagent for an irregular imported comics fix. One of my abiding memories is the arrival of an annual amongst the stack - a bumper-sized issue promising a huge story, and bonus content: maps of Metropolis, blueprints of the Batmobile, all that jazz. This week I'm thrilled to see one of my favourite current titles, Black Hammer, get the annual treatment. Following on from a terrific climax to the first arc, the annual looks to be a treat for us devoted fans of Jeff Lemire. Speaking of the Canadian genius, I will naturally be picking up Descender too. I recently spoke to a fellow geek who for years had stuck to books from the Big Two, and he was effusive in his praise for Descender - it's certainly a title that crosses boundaries and genres with aplomb. Wednesday also sees the next chapter of Ed Brubaker and Sean Phillips' magnificent Kill Or Be Killed, which continues to be a must-read (along with every other Brubaker-Phillips production.) I'm really looking forward to picking up the first issue of The Few from Image. This was one of my picks when we did January's Ten Forward, and I'm always a sucker for a good post-apocalyptic tale. That's certainly a pull-list to lighten up a drab January, so whatever you're picking up - happy reading!